The Twelve Tribes of Israel will be sealed according to their tribe, all 144,000 of them. But it is not just only them that will be chosen, for there is a great multitude mentioned as well. A people who no one can even count, being of different races, colors, classes, & creeds. It is these people who have accepted YHWH's Messiah just like the Nation of Israel! However, the First Chosen of YHWH is Israel & it they who I choose to discuss more in this topic. Because Israel is where the redemption comes from. As the Messiah even said," Salvation is of the Yahuwdim( Jews)." We will be in our white robes & sealed by Yahwah according to our Tribes! 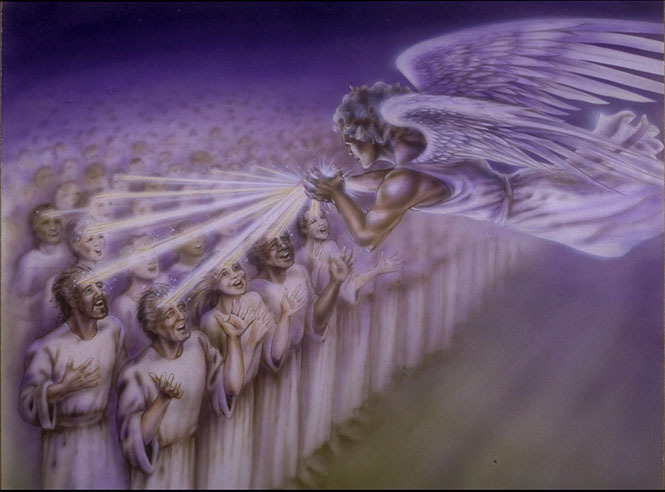 We shall be twelve lights of Israel(earthly not celestially) written in Revelations 12, who will keep shining unto YAH!! These are the ancient Israelites who shall be united again as the Nation of Israel. "And they shall come from the east, and from the west, and from the north, and from the south, and shall sit down in the kingdom of Yahwah." (Luke 13: 29) This is rather about the ancient Israelite Remnant of Yah, who are also spiritual, & not just people who accept the Faith. Other peoples consist of the Great Multitude, but they are not the 144,000, who shall be sealed according to their tribes. This topic goes back to what I said on the Noah's Sons link.. Revelations 7, shows us that all peoples will be rallying together before Yah and His Lamb, Yahshua Ha Mashiyach. So I couldn't practice racial division but Unity in one! For I know that our Elohiym is always international. It will not only be Shemites, but Hamites & Japhethites in the New Yerushalayim as well! We all have to be accept the Faith, no matter if we're of Shem, Ham, or Japheth. . 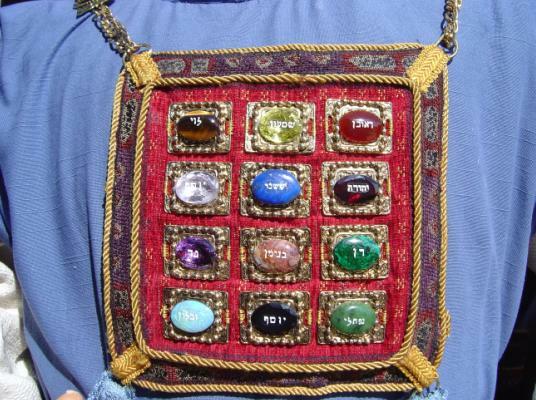 These Twelve Stones, signify the Twelve Tribes of Israel. Each of them represent when the Children(Yaledeem) of Israel were born, according to their tribal household. The priest wore them to identify us Yisraelites. We will receive white robes & these stones shall symbolize us spiritually. Even in Revelations 21:19,20, we see some stones mentioned. "And the foundations of the wall of the city were garnished with all manner of precious stones. The first foundation was jasper; the second, sapphire; the third, a chalcedony; the fourth, an emerald; The fifth, sardonyx; the sixth, sardius; the seventh, chrysolite; the eighth, beryl; the ninth, a topaz; the tenth, a chrysoprasus; the eleventh, a jacinth; the twelfth, an amethyst." These stones are not really the same as the original ones, but are significant & important still in Israel. The Twelve Stones reveal the spiritual side of Israel! "Ye also, as lively stones, are built up a spiritual house, an holy priesthood, to offer up spiritual sacrifices, acceptable to Yahwah by Yahshua. "( I Peter 2:5) Israel must come together & clad themselves in white robes in Zion! So it was in the Beginning, so shall it be in the End to come. Selah! ISRAEL SHALL SEE THE KING!! On this marvelous day, the Twelve Tribes of Israel, shall see the Son of Man coming from Heaven, and they shall have joy in their hearts, while the earthly tribes shall mourn when they see Him because of their wicked ways. Israel shall see the Messiah indeed, & He shall establish the Kingdom of Yah here on earth! The Twelve Apostles of Yahshua will be judging the Twelve Tribes of Israel on this Day. Do you see what this picture shows us here? Different kinds of peoples together as one. Internationality now, united we stand! I can't wait for this glorious day to come! All of Yah's Children in oneness with the other nations, no racism/ prejudice just YHWH Love always! If some of us came from the original Israel, then we must know the vibes, & share it with others! The Twelve Tribes of Israel are mentioned as being the 144,000 elected saints. Yet I couldn't forget this great multitude neither! Blessed be the 144,000 Saints of the Most High YHWH our Elohiym! YAHWAH IS EL SHADDAY, AND YAHSHUA IS OUR MALAK( KING)! The Twelve Tribes of Israel are the 144,000 Saints of the Most High YHWH!